My good mate Ant of The Aerial Perspective was very kind to invite me along to Greyton, where he needed to take some pictures. We cruised out there in the Vito early this morning to find the town dead still (wind and street-life) with heavy dew on the ground, and so we stopped at a local coffee shop for tea and toast. 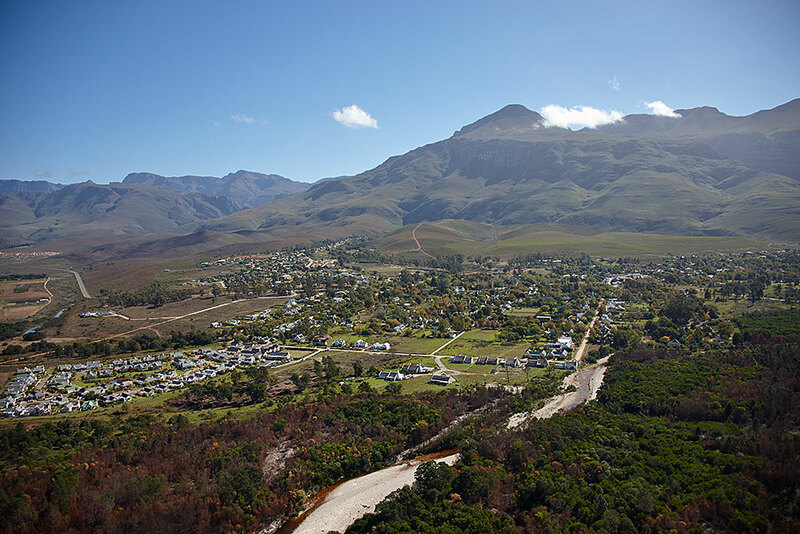 Greyton is as pleasantly bucolic as I remember, albeit somewhat more developed these days. After completing consumption of our comestibles we went looking for a launch area. The Greyton Sports Club had a nice field, but it was still very wet and surrounded on three sides by trees. A foray down the other end of town was more fruitful…well, too fruitful, in fact. Not only did we find a great little field, which was slightly raised and offered a puff of wind, but it was also downwind of the dump and sewage settlement ponds. To complete the scene, a large herd of splendidly flatulent bovines stood contemplating us from over the fence. Perfect. Although the field was small and the ponds large, the light wind was conveniently blowing across the corners, offering a decent run and space to climb out. We rigged quickly, and then I helped Ant launch so that he could get the photography done quickly. I was rapidly ready to go, and then in my enthusiasm flooded my engine and had to take if off to get it restarted. By that stage, the wind had almost disappeared, and what little remained was now blowing directly over the ponds, across the short axis of the already short field. Eish. Eish… the work, she has been too much. I have been nose-to-grindstone for quite some time, but the experience has been incredibly rich, with a number of firsts. Some of those stories will follow, I hope, but the blog takes a back seat at these times. Unfortunately, the flying has also been exceptionally sparse. In the absence of my own escapades, I stumbled across this video. It captures much of the essence of PPG in South Africa. Enjoy. 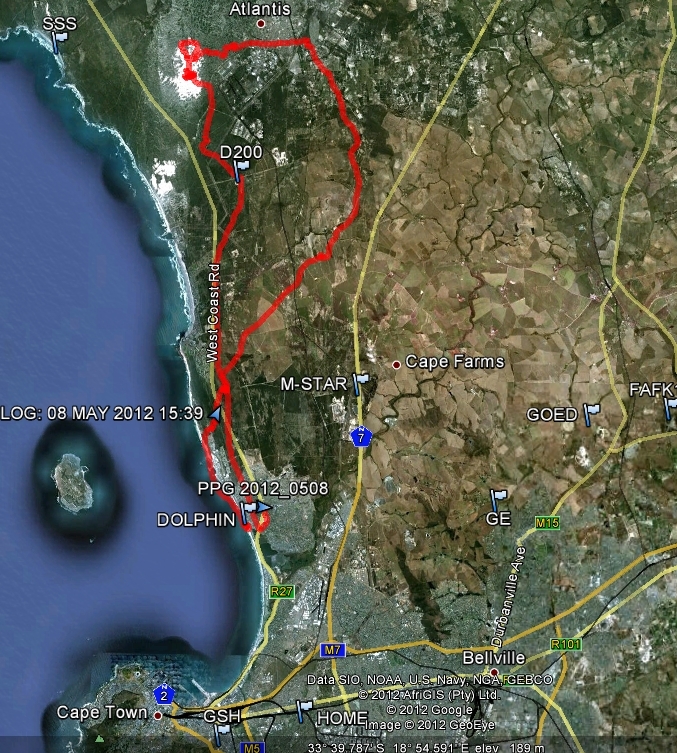 Paramoteur: South African Tour 2012 from Luc Trépanier on Vimeo. 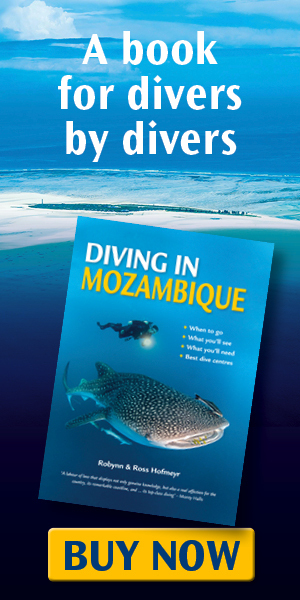 En septembre 2012, Cyril et moi sommes allés en Afrique du Sud pour visiter au sol, mais surtout pour survoler en paramoteur ce magnifique pays. Nous y avons rencontré des pilotes ayant un haut niveau de maîtrise de notre sport. Ces derniers nous ont grandement facilité la tache au cours de notre voyage et nous en sommes reconnaissant. L’Afrique du Sud est un pays offrant des paysages et une faune unique. Ce petit vidéo sans prétention relate quelques vols que nous y avons fait. C’était mon premier voyage dans cette région du monde et je ne souhaite qu’une chose, c’est d’y retourner. In September 2012, Cyril and I went to South Africa to visit the country from the ground but also to fly with our paramotor over some magnificant places. We have met pilots with high skill level who help us along our trip through the country and we thank them. South Africa has a unique wildlife and landscapes to offer. This unpretentious little video present some flights that we have done. It was my first trip to this part of the world and the only thing I wish is to go back. 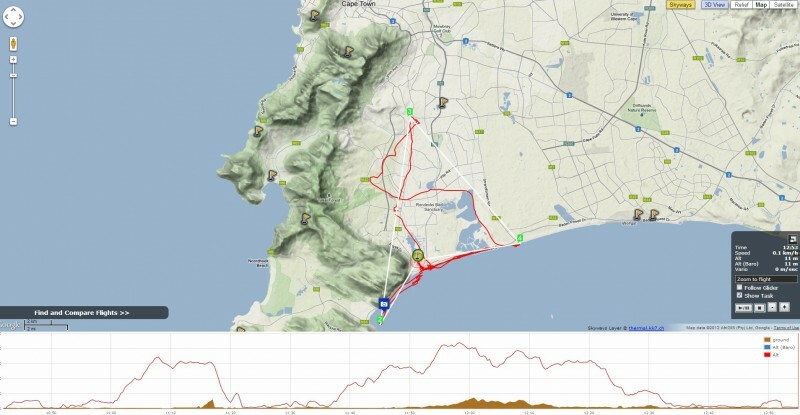 No firm plans, a whole big sky, and lots of familiar places to explore from a new perspective: I fly Muizenberg, the beach, mountain and wetlands, meet up with a flying friend for an aerial photo shoot, and end up with a 40km FAI triangle. 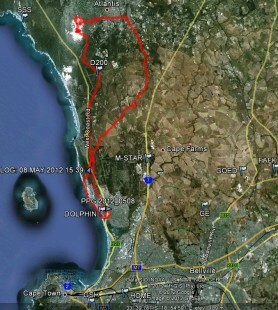 Any given Sunday with a westerly you can find PPG’s flying at Dolphin Beach near Blouberg. After enjoying the coastal dunes I head inland to Atlantis to play in it’s weird white-sand desert. It was an odd juxtaposition: sand-boarders, quad- and motorbikers, 4WD enthusiasts, a microlight and my PPG all weaving through the dunes. While you’re at it, why not add your own? It’s been quite a while since the flying that generated this footage, but I finally set aside a rainy Saturday and cut together a rough montage. The story can be found in the blog archive, so I won’t repeat it here. In essence: some magic crack-of-doom flying in the middle of summer, when the sun rises early enough for me to get a flip in before I have to be at the hospital. Not many better ways to start the day. Watch it on high quality if you can or come round and see it in 1080p HD at my place over a cup of coffee! I went on a lovely post-call aerial meander today. While I caught up on sleep during the morning the wind turned light north-west; cold sea air began to replace the more boisterous south-easter and most of the PPG fraternity were congregated at Dolphin Beach. I joined the crowd around three o’clock and was airborne shortly thereafter with a vague plan to join a group flying up to Melkbosstrand along the coast. Unfortunately, a stubborn pressure-knot in my lines forced a quick circuit back to the field to sort it out, so I ended up chasing after them on full bar and open trims, idly watching the surfers below. 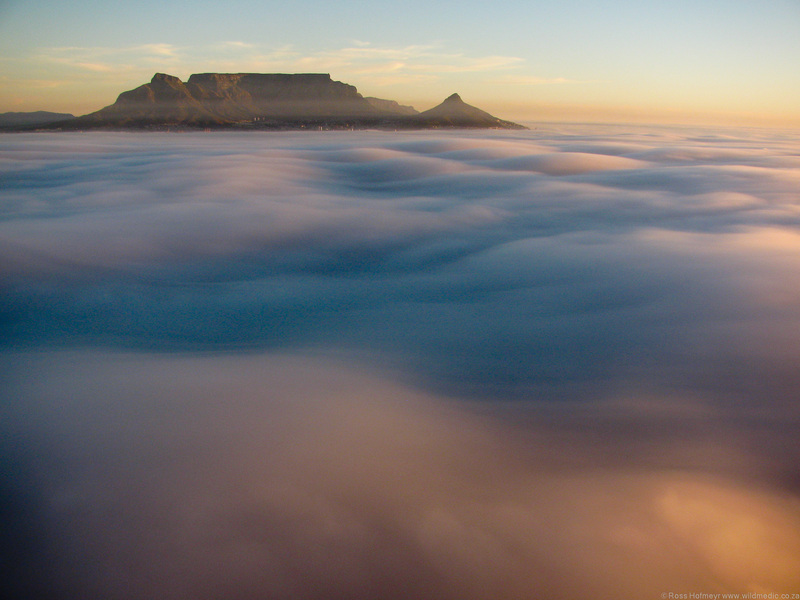 By the time I caught up they had passed Big Bay and encountered a bank of sea fog just making landfall. The group turned back. My natural wanderlust extends to airborne endeavours, and I knew that I’d be frustrated flying around Dolphin Beach until the mist arrived there and shut things down completely, so I decided to fly over to Blouberg Hill and survey the options from there. The hill peaks at about 700ft and features some old military ramparts, which are now being converted into nature reserve accommodation. I used some ridge lift on the NW side for a free ride to the top and examined the options. The sea fog looked as if it was thinning out to the north, and experience has taught me that while the sun shines if rarely makes much progress inland. I’d already discovered (to my surprise) that there was very little turbulence over the hill. I decided to venture a little further into the farmlands, make a big loop to which ever side felt good, and try my luck later with the fog at the beach – there are always plenty of landing options elsewhere for a PPG. These courtesy of Hannes Jansen, one of the other pilots on our sortie to Yzerfontein recently. I do so love to see my beaut orange & yellow Eden 4 in flight. 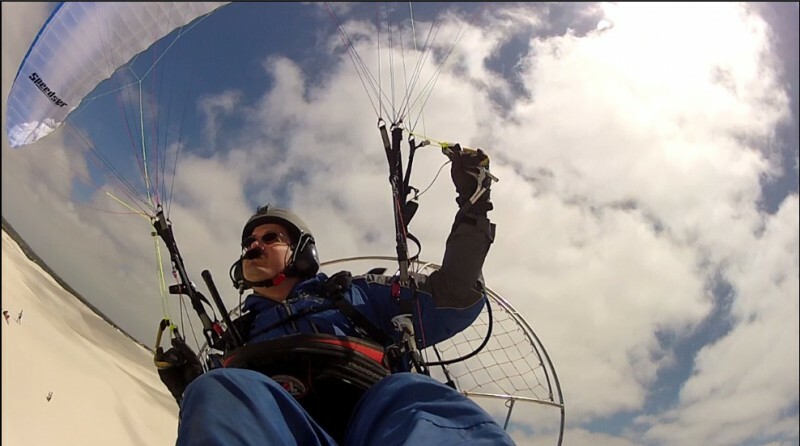 The link to this video has been circulating the flying community, and it explains the thoughts and feelings behind flying powered paragliders so nicely that I have to pass it on. If you have a fast connection, click the settings (cog wheel) and watch it at 720p – it’s worth the wait.